Many musicians complain of numbness and pain in the hand, forearm and arm. They can prevent repetitive strain injury, ease pain and tension by stretching regularly. By nature, learning music involves repeating until a passage or technical exercise until a high level of proficiency, fluency and artistry is achieved. Instrumentalists use their finger, hand and arm muscles extensively when practicing and performing. This makes them especially vulnerable to a repetitive stain injury such as Carpal Tunnel Syndrome, Bursitis and Tendinitis. Musicians can ease arm and hand pain, relieve tension and prevent injuries by incorporating stretching exercises into their daily routine. Stretching exercises should be done when the muscles are warm. For example, stretches can be done after a shower, after a bath or after performing some light exercises. Musicians should always stretch prior to practicing. They should also take regular breaks when practicing to stretch. For example, stretches can be done before switching to a new piece or after practicing a physically challenging section of music. Musicians should also stretch prior to performing and in between performances. Purpose: Prevent Tendinitis and Trigger Finger, relieve tension and increase blood circulation in the hands. Hold your hands in a loose fist in front of you. Flick your fingers so that your fingers are outstretched. Pretend that you are flicking water. Hold your fingers in an outstretched position for 10 seconds. Purpose: Prevent Tendinitis, relieve tension and increase blood circulation in the wrists. 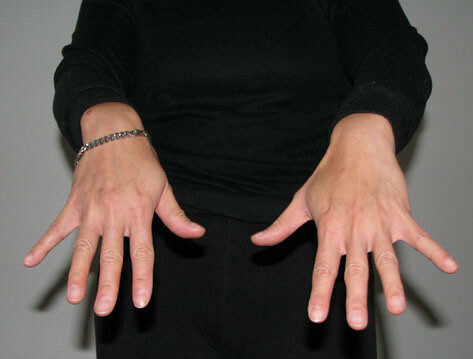 Rotate your wrists in a circle several times in one direction. 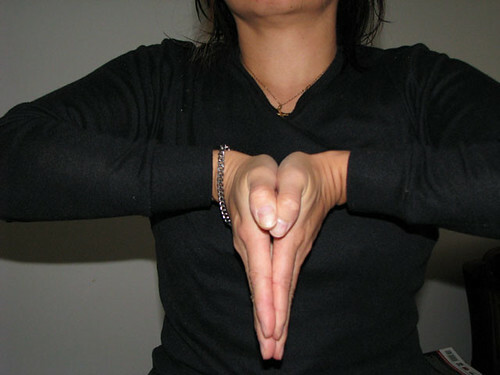 Rotate your wrists in a circle in the other direction. Variation: Sticking out your thumb as if you were hitchhiking. Interlace your fingers together in front of you. Keep track of which thumb is resting on top. 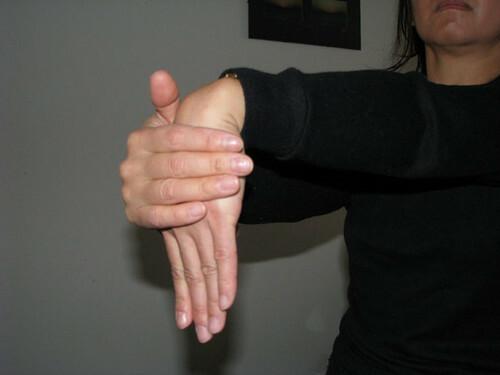 Rotate your wrists in a circle several times in one direction. Start slowly and as you get more comfortable, increase the speed. Reposition your hands so that the opposite thumb is resting on top. Purpose: Prevent Tendinitis in the elbow and forearm, relieve tension and increase blood circulation. Place your hands together in a praying position. Push your hands together and push your arms downward until you feel a gentle stretch. Hold the stretch for 10 - 20 seconds. Hold your left arm straight in front of you with your palm facing forward as if to indicate "stop". Brace your left palm with your right hand. 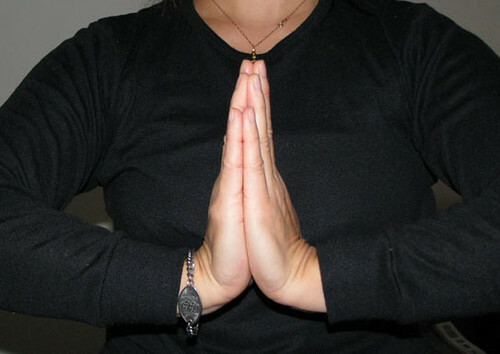 Gently pull the fingers in your left hand towards you until you feel a gentle stretch. Hold for 10 - 20 seconds. For a deeper, isometric stretch, push your left arm forward, into your right hand, as you pull your left hand towards you. Extend your left arm in front of you, holding your arm straight. Let your hand flop downward at the wrist. Place your right palm over your left hand (above the fingers). Gently push your left hand towards you with your right hand until you feel a gentle stretch. With your right forearm on a table and let your right hand flop down. Place a soup can in your right hand. Beginning with your wrist level with your forearm, slowly let your hand point downward until you feel a gentle stretch in your forearm extensors. Steadily raise your hand so that your wrist is level with your forearm. Repeat the exercises with the opposite arm. Purpose: Prevent Tendinitis in the elbow and upper arm, relieve tension and increase blood circulation. Hold your left elbow with your right hand. Gently pull your left arm towards you until you feel a gentle stretch. Repeat this stretch at least once. Never stretch to the point of pain. Strive for a gentle stretch. If you are already suffering from a repetitive strain injury, consult a doctor, chiropractor, physiotherapist or registered massage therapist (licensed in therapeutic massage) before attempting these exercises. By spending as little as five minutes a day on stretching exercises, musicians can alleviate symptoms of carpal tunnel syndrome, prevent tendinitis. This can lead to many years of healthy and pain-free years of music-making. You may find more information through these links: Benefits of Stretching, Face and Neck Stretches for Musicians, The Art of Practicing, Understanding Musician Injuries, Simple Exercises to Strengthen the Wrists and Wrist Exercises.